Draft: 2004, Cleveland Indians, 19th rd. A non-roster invitee to Spring Training, Chris has appeared in the majors in each of the last nine seasons with Cleveland (2009-10, 2014, 2016), Seattle (2011), Tampa Bay (2012-13), Texas (2014-15) and Minnesota (2017) ... overall, he is in his 15th professional season... Has batted .218 (190-for-870) with 42 doubles, 22 homers and 82 RBI in 366-career major league games ... has thrown out 39-of-176 (22.2%) of attempted base stealers in his career... Appeared in a career-high 77 games with Minnesota last season ... has appeared in at least 40 major league games in five separate campaigns... Has twice appeared in the postseason ... played in two games in the 2015 ALDS with Texas and last season played in Minnesota's Wild Card Game... Named a Carolina League mid-season All-Star in 2007... Selected by Cleveland in the 19th round of the 2004 draft out of the University of Nevada-Reno ... was named first-team All-WAC in 2003 and second-team All-WAC in 2004. 2017 A non-roster invitee to Spring Training with the Twins, Chris made the club's Opening Day roster and set single-season career-highs in games (77), runs (28), hits (41), home runs (7), RBI (16) and walks (33)... Made six pitching appearances: April 23 vs. Detroit, May 6 vs. Boston, May 31 vs. Houston, June 6 at Seattle, June 12 vs. Seattle and June 22 vs. Chicago (A.L.) ... tied Boston's Eddie Lake in 1944 for most in a season by a position player ... became the first player to pitch and catch at least six games since the late 1800s ... had a 7.20 ERA (4 ER/5.0 IP) with seven hits and one home run allowed on the mound... Recorded his first career multi-homer game, June 15 vs. Seattle, including four RBI... Caught 59 games (54 starts) and caught 475.2 innings... Selected as the recipient of the Mike Augustin "Media Good Guy" Award for the Twins. Batted .216 (30-for-139) with four doubles, four homers and 11 RBI in 68 games with Cleveland ... began the season in the Texas organization before being traded for cash, May 4 ... marked his third stint in the Cleveland organization... Spent spring training with Texas and missed time late in camp with a left ankle injury that eventually turned into a staph infection that required surgery and one-week hospital stay in early April ... began the season on the disabled list... Played 59 games (42 starts) at catcher as the Indians went 22-20 (.524) in his starts ... threw out 4-of-21 runners (19%) attempting to steal. Was purchased from Round Rock (AAA) on July 31 and split time with Bobby Wilson behind the plate in August and September when Robinson Chirinos and Carlos Corporan were injured…started 32 regular season games at catcher with Texas going 25-7 (.781) in those contests, winning each of the first five and 10 in a row from Sept. 8-25…set major league career bests for runs (19), total bases (48), homers (5), and RBI (14). Combined to hit .241 (28-116) with 11 RBI in 42 games with Texas and Cleveland…spent spring training with Oakland before being claimed on waivers by the Rangers on March 28…was on Texas' roster for March 31 season opener vs. PHI (DNP) before being designated for assignment on April 1…cleared waivers on April 3 and was granted free agency April 5 before re-signed to a minors contract on April 10…had contract purchased by Texas on May 20…started 26 games at catcher with club going 11-15 in those contests, and three at first base…was starting catcher for 11 of 12 Yu Darvish starts during his stint with Texas…pitched a scoreless ninth inning on July 10 vs. LA Angels….hit .417 (15-36) with 5 2B and 6 RBI in first nine games but just .183 (13-71) in final 24 contests…hit safely in career-high eight straight, May 22-June 6…had career-high four hits in second game with Rangers on May 22 at Detroit, first Ranger with a four-hit game within first two games with the club since Danny Thompson on June 4, 1976 vs. Detroit…was on Paternity List, Aug. 4-6, then was DFA'd again on Aug. 7 and outrighted to minors on Aug. 9…was traded to Cleveland on Aug. 23 and was 0-for-8 in nine games the rest of the year…had second stint on Paternity List, Aug. 29-31. Spent nearly the entire regular season at Triple-A Durham before he was called up by Tampa Bay when rosters expanded Sept. 1…went 1-for-3 (.333) with a double and walk in four games with the Rays … appeared in one game each at catcher, first base and third base…also pinch hit twice, collecting a double and walk … batted .224 with three home runs and 22 RBI in 95 games with the Bulls…added 57 walks for a .350 on-base percentage…hit .235 (51-for-217) against right-handed pitching compared to .198 (18-for-81) against left-handers…drew 26 of his 57 walks against lefties for a .376 on-base percentage, compared to .339 against righties…had one home run and 11 RBI in 70 games over the first four months of the season…then had two home runs and 11 RBI in 25 games in August…hit .370 with two of his three home runs in the ninth inning … appeared in 56 games at catcher, 19 in right field, 13 in left field, seven at first base and one at third base … committed just one error behind the plate for a .998 fielding percentage …tossed out 10-of-40 (25.0%) attempted base stealers…batted .274 while catching, .167 at all other positions…hit in every spot in the order except first and second…batted fifth and seventh 23 times and eighth 22 times. DURHAM: Batted .298 over his first 16 games through April 23…scored a season-high three runs April 11 against Norfolk…went 0-for-2 but drew a season-high three walks April 28 at Syracuse … finished April with a .262 batting average and then hit .265 in May…went 4-for-5 with three runs scored and his only stolen base of the season May 15 at Rochester…the hits were a season high and the runs matched his best…that lifted his batting average to .270…went 0-for-3 over his next two games before going on the disabled list May 28 with a sprained left hand…was reinstated June 16 and hit .201 in 60 games following his return … including .147 in June…went 4-for-40 (.100) over a 13-game stretch from June 24 to July 8…then hit safely in a season-high seven consecutive games from July 9 to 18…went 9-for-25 (.360) with three doubles during the streak…matched his season high with three walks July 19 against Pawtucket … finished July with a .238 batting average but then hit .184 in August…however, seven of his 14 hits in the month were for extra bases (five doubles, two home runs)…hit just one home run over his first 79 games…then went deep in back-to-back contests Aug. 11 against Charlotte and Aug. 13 at Gwinnett … drove in a season-high three runs against Charlotte…was recalled by Tampa Bay Sept. 1 and missed the final two games of the regular season and the playoffs. The backstop completed his fourth major league season...split the year between Triple-A Durham and the Rays...played in 42 games (31 starts at catcher) over two stints in the majors: April 15-May 28 and Sept. 1 through season's end...hit .221 (19-for-86) with six RBI in 35 games at the major league level...Appeared in 11 games (10 starts) after his second recall on Sept. 1 and hit .406 (13-for-32) with one HR, five RBI and three doubles...started the finalfive games of the season and hit .500 (7-for-14 with at least one hit in each game...In his first stint with the Rays, appeared in 24 games (21 starts, all at catcher) from April 15-May 28...hit .191/.236/.206 (13-for-68) during that stretch...was selected from Durham on April 15 to replace injured C Jose Lobaton and made his Rays debut that day in Boston, going 2-for-4 with a pair of singles...Drove in the go-ahead run on a two-out, RBI single in the eighth inning in a 4-3 victory on Sept. 3 vs. NYY bringing the Rays to within 2.5 games of the first-place Yankees...it was his second career go-ahead hit and his first since July 27, 2009 with Cleveland...On Oct. 1 vs. BAL delivered a two-run double in the seventh inning to give the Rays a 4-1 lead in the eventual 5-3 win, helping the Rays stay alive in the postseason race...they were eliminated later that night with Oakland's victory...Lone home run came on Sept. 29 at CWS, a solo shot off RH Deunte Heath...Also appeared in one game each at 1B, 3B and LF, the only Rays catcher ever to play three other positions...Caught five of 25 attempted base stealers (20 pct.) and 21 of 82 (25.6 pct.) for his career...Was called for catcher's interference a clubrecord three times, the most in the majors since LAA Mike Napoli in 2006...became the first AL catcher to be called for catcher's interferencein back-to-back appearances (April 29-30) since DET Javier Cardona on Aug. 14-16, 2001 and the first in Rays history to do so...At Triple-A, hit .310/.389/.483 (81-for-261) in 71 games for the Bulls, including .375 (36-for-96) against left-handed pitchers and .351 (26-for-74) with runners in scoring position...appeared at several positions for Durham: C (47 games), LF (11), RF (11), 3B (2) and 1B (1)...Signed a minor league contract on Feb. 16 with an invite to spring training...appeared in 24 spring games, spending time at catcher (33 innings), 1B (14), 3B (36), LF (16), DH (3). Reassigned to Triple-ATacoma at the end of springtraining but did not appearin any games before beingselected by the Mariners onApril 10 after C Adam Moorewas placed on the 60-day DL...hit .203 (12-for-59) in24 games...played 20 games at catcher (17 starts),3 in left field (1 start) and 2 at first base (2 starts)...threw out 6 of 20 attempted base stealers (30 percent)and did not have a passed ball in 152 inningsbehind the plate...was on the disabled list fromJune 29-Sep 1 with a strained left oblique...appearedin 13 games on a rehab assignment withTacoma from Aug 12-31...designated for assignmenton Feb 7, 2012. Split the season between Cleveland and Columbus (AAA)...was with the Indians fromJuly 10-end of the season as the backup catcher and utility player...spent the first threemonths of the season with Columbus...hit .276 (54x196) with 32 runs, 10 doubles, 9home runs and 32 RBI in 55 games...appeared in 34 games in the outfield, 18 at catcher,3 at first base and 1 at third base with the Clippers...promoted to Cleveland on July 10(M. Redmond DFA)...made 19 starts at catcher (24 G) and saw action in 2 games in theoutfield...drove in career-high 4 runs and hit only homer Aug. 27 vs. Kansas City. Began the season at Columbus (AAA) and spentthe last 4 months of the season with the Indians after his recall on May 31...recalled toCleveland on May 31 (Grady Siemore DL)...made his MLB debut June 3 at Minnesotaand collected his first ML hit and home run June 4 against the Twins (off Scott Baker)...appeared in 18 games at first base (13 GS), 14 games in left field (9 GS), 7 games in RF (4GS) and 8 games at catcher (6 GS)...played briefly for Caracas in the Venezuelan winterleague after the season. Split the year between AA Akron and AAA Buffalo... Between the 2 stops this year he hit .304 (113-372) with24 2B, 2 3B, 9HR & 45 RBI in 109 games...Also scored 69 runs...His .304 average was the 2nd highest of anyIndians minor leaguer...Began the season at AA Akron where he hit .339 (60-177) in 55 games w/15 2B, 6HR &26 RBI (.487OB/.537SLG/1.024OPS) and hit in 11 straight games from May 10-26 and at one point from April20-May 26 he hit in 22 of 25 games...Hit .352 (42-122) off RHP w/an OB% of .497 with Akron...Appeared in48 games at catcher, 4 games at first base, 1 game at third and 2G in left field before being promoted to AAABuffalo on June 19...Got better as he gained more experience at AAA, hitting .310 (26-84) from August 1-Sept. 1 w/4 2B, 2HR& 10RBI over his final 22 games to raise his AAA average from .243 to .272...Hit a grand slam and drove inseason-high 4 runs on August 23 at Syracuse...Went 3 for 5 w/a 2B, HR & 2RBI on Sept. 1 at Rochester, thefinal day of the season...With Buffalo he appeared in 51 games at catcher and 3 games at third base...Hit .303(46-152) over his last 42 games from July 3- end of season with the Bisons...Hit .297 (27-91) with runnerson for Buffalo...Between the 2 stops hit .300 (36-120) off LHP and .306 (77-252) off RHP...Also hit .319 (59-185) with runners onbase and .294 (32-109) with RISP...Combined on year threw out 20 of 73 runners attempting to steal (27.4%). Spent most of the season at Class-AKinston where his team-high 20 HR ranked tiedfor 3rd in the Carolina League...ranked 2nd in theIndians farm system with 26 HR and a .526 SLG...was named a CL midseason All-Star and won thehome run derby. Spent his second year at Class-A LakeCounty...appeared at catcher for the first time (62games at catcher, 3 at 3B and 1 at 1B). Made his pro debut at Short-A MahoningValley...led the New York-Penn League in total bases(137), SLG (.527), 2B (23) XBH (36) and ranked2nd in OBP (.419), 4th in HR (10) and 5th in hits(78)...named a NYPL postseason All-Star. October 29, 2018 C Chris Gimenez elected free agency. 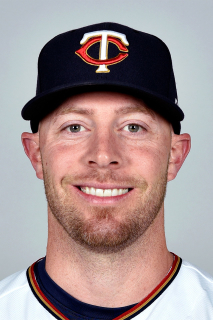 September 1, 2018 Minnesota Twins selected the contract of C Chris Gimenez from Rochester Red Wings. August 30, 2018 Minnesota Twins traded C Bobby Wilson to Chicago Cubs for C Chris Gimenez and Player To Be Named Later. August 30, 2018 C Chris Gimenez assigned to Rochester Red Wings. July 6, 2018 Chicago Cubs sent C Chris Gimenez outright to Iowa Cubs. July 4, 2018 Chicago Cubs designated Chris Gimenez for assignment. May 26, 2018 Chicago Cubs selected the contract of C Chris Gimenez from Iowa Cubs. January 22, 2018 Chicago Cubs signed free agent C Chris Gimenez to a minor league contract and invited him to spring training. January 22, 2018 C Chris Gimenez assigned to Iowa Cubs. November 6, 2017 C Chris Gimenez elected free agency. April 2, 2017 Minnesota Twins selected the contract of C Chris Gimenez from Rochester Red Wings. January 26, 2017 C Chris Gimenez assigned to Rochester Red Wings. January 12, 2017 Minnesota Twins signed free agent C Chris Gimenez to a minor league contract and invited him to spring training. November 21, 2016 C Chris Gimenez elected free agency. November 18, 2016 Cleveland Indians sent C Chris Gimenez outright to Columbus Clippers. November 3, 2016 Cleveland Indians activated C Chris Gimenez. October 14, 2016 Cleveland Indians reassigned C Chris Gimenez to the minor leagues. May 4, 2016 Texas Rangers traded C Chris Gimenez to Cleveland Indians for cash. May 3, 2016 Texas Rangers designated C Chris Gimenez for assignment. April 25, 2016 Texas Rangers sent C Chris Gimenez on a rehab assignment to Frisco RoughRiders. April 3, 2016 Texas Rangers placed C Chris Gimenez on the 15-day disabled list retroactive to March 27, 2016. July 31, 2015 Texas Rangers selected the contract of C Chris Gimenez from Round Rock Express. May 30, 2015 Round Rock Express activated C Chris Gimenez from the 7-day disabled list. May 22, 2015 Round Rock Express placed C Chris Gimenez on the 7-day disabled list. November 20, 2014 Texas Rangers signed free agent C Chris Gimenez to a minor league contract and invited him to spring training. November 20, 2014 C Chris Gimenez assigned to Round Rock Express. November 3, 2014 Cleveland Indians sent C Chris Gimenez outright to Columbus Clippers. September 1, 2014 Cleveland Indians activated C Chris Gimenez from the paternity list. August 29, 2014 Cleveland Indians placed C Chris Gimenez on the paternity list. August 23, 2014 Texas Rangers traded C Chris Gimenez to Cleveland Indians. August 10, 2014 Texas Rangers sent C Chris Gimenez outright to Round Rock Express. August 7, 2014 Texas Rangers designated Chris Gimenez for assignment. August 4, 2014 Texas Rangers placed C Chris Gimenez on the paternity list. May 20, 2014 Texas Rangers selected the contract of C Chris Gimenez from Round Rock Express. April 10, 2014 C Chris Gimenez assigned to Round Rock Express. April 9, 2014 Texas Rangers signed free agent C Chris Gimenez to a minor league contract. April 5, 2014 C Chris Gimenez elected free agency. April 3, 2014 Texas Rangers sent Chris Gimenez outright to Round Rock Express. April 1, 2014 Texas Rangers designated Chris Gimenez for assignment. March 28, 2014 Texas Rangers claimed C Chris Gimenez off waivers from Oakland Athletics. December 20, 2013 Oakland Athletics claimed C Chris Gimenez off waivers from Tampa Bay Rays. October 12, 2013 Chris Gimenez roster status changed by Tampa Bay Rays. October 4, 2013 Tampa Bay Rays reassigned C Chris Gimenez to the minor leagues. September 1, 2013 Tampa Bay Rays recalled C Chris Gimenez from Durham Bulls. June 16, 2013 Chris Gimenez roster status changed by Durham Bulls. May 28, 2013 Durham Bulls placed C Chris Gimenez on the 7-day disabled list. March 25, 2013 Tampa Bay Rays optioned C Chris Gimenez to Durham Bulls. September 1, 2012 Tampa Bay Rays recalled Chris Gimenez from Durham Bulls. May 28, 2012 Tampa Bay Rays optioned Chris Gimenez to Durham Bulls. April 15, 2012 Tampa Bay Rays selected the contract of Chris Gimenez from Durham Bulls. April 8, 2012 Chris Gimenez roster status changed by Durham Bulls. April 3, 2012 C Chris Gimenez assigned to Durham Bulls. February 17, 2012 Tampa Bay Rays signed free agent C Chris Gimenez to a minor league contract and invited him to spring training. February 14, 2012 C Chris Gimenez elected free agency. February 6, 2012 Seattle Mariners designated C Chris Gimenez for assignment. December 14, 2011 Seattle Mariners signed free agent C Chris Gimenez. December 12, 2011 C Chris Gimenez elected free agency. September 1, 2011 Seattle Mariners activated C Chris Gimenez from the 60-day disabled list. August 12, 2011 sent C Chris Gimenez on a rehab assignment to Tacoma Rainiers. July 3, 2011 Seattle Mariners transferred C Chris Gimenez from the 15-day disabled list to the 60-day disabled list. April 8, 2011 Seattle Mariners selected the contract of C Chris Gimenez from Tacoma Rainiers. December 14, 2010 Seattle Mariners signed free agent C Chris Gimenez to a minor league contract and invited him to spring training. December 14, 2010 Chris Gimenez assigned to Tacoma Rainiers. November 6, 2010 Chris Gimenez elected free agency. October 29, 2010 Cleveland Indians sent Chris Gimenez outright to Columbus Clippers. July 10, 2010 Cleveland Indians selected the contract of Chris Gimenez from Columbus Clippers. February 24, 2010 Cleveland Indians sent Chris Gimenez outright to Columbus Clippers. February 24, 2010 Cleveland Indians invited non-roster 1B Chris Gimenez to spring training. October 29, 2009 1B Chris Gimenez assigned to Leones del Caracas. May 31, 2009 Cleveland Indians recalled Chris Gimenez from Columbus Clippers. June 11, 2004 Cleveland Indians signed C Chris Gimenez.